Steady light rain this evening. Showers continuing overnight. Low 42F. Winds WNW at 5 to 10 mph. Chance of rain 60%.. Steady light rain this evening. Showers continuing overnight. Low 42F. Winds WNW at 5 to 10 mph. Chance of rain 60%. 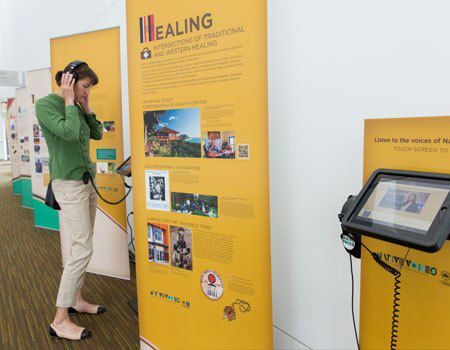 The Native Voices display offers a variety of audio and visual programs for participants. KAMIAH -- Kamiah High School has been selected in a competitive application process to host a traveling exhibition sponsored by the American Library Association and the U.S. National Library of Medicine. As one of 104 grant recipients selected across the country, KHS Library will host the traveling exhibition for a six-week loan during its tour of the United States from May 1 through June 6. The public will have opportunity to visit the exhibit Wednesday, May 1, from 3 to 6 p.m., and Monday, May 13, during the school’s culture fair from 3 to 6 p.m. Native Voices: Native Peoples’ Concepts of Health and Illness explores the interconnectedness of wellness, illness and cultural life for American Indians, Alaska natives and native Hawaiians. Stories drawn from both the past and present examine how health for native people is tied to community, the land and spirit. Through interviews, native people describe the impact of epidemics, federal legislation, the loss of land, and the inhibition of culture on the health of native individuals and communities today. Topics include: native views of land, food, community, earth/nature, and spirituality as they relate to native health; the relationship between traditional healing and Western medicine in native communities; economic and cultural issues that affect the health of native communities; efforts by native communities to improve health conditions; and the role of American Indians in military service and healing support for returning native veterans. To make the Native Voices information accessible to people even if they can’t come to Kamiah High School, there is an online version of the exhibition at www.nlm.nih.gov/nativevoices. Arrangements can be made for additional group visits. For information contact Colleen Olive via e-mail at colive@kamiah.org.